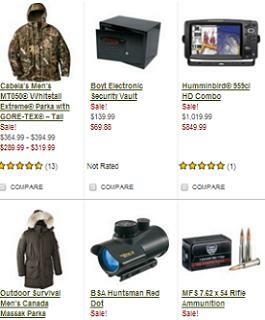 Weekly specials from Cabela’s valid April 12 – April 28, 2019: $69.88 Boyt Electronic Security Vault; $289.99-$319.99 Cabela’s Men’s MT050 Whitetail Extreme Parka with GORE-TEX – Tall; $849.99 Humminbird 959ci HD Combo; $439.88 Outdoor Survival Men’s Canada Massak Parka; $144.88 Cabela’s Men’s Brush Buster Waterfowl 4-in-1 Systems Wading Jacket with GORE-TEX and Thinsulate – Regular; $219.99 Cabela’s Pinnacle Boa Extreme 800-Gram Boots; $55.88 Cabela’s Men’s Thermal Zone Merino Wool 1/2-Zip Top; $8.99 Cabela’s Men’s MTP Medium-Weight Crew – Regular; $119.88 Garmin nuvi 52 LM GPS; $69.99 Cabela’s Men’s Faribault Vest with 4MOST DOWN – Regular; $99.99 Merrell Women’s Reflex GORE-TEX Hiker; $209.99 Cabela’s Pinnacle Boa Extreme 400-Gram Boots; $139.88 Cabela’s Women’s Pinnacle Zipper Snake Boots; $9.88 Cabela’s Men’s ScentBlocker Beanie; $99.99 Mabela’s Men’s Outfitter Series Harrington Wool Bomber Jacket – Regular; $38.88 Cabela’s Women’s E.C.W.C.S. Medium-Weight 1/4-Zip Top; $89.99 The North Face Momentum 300 Jacket; $46.88 Predator Men’s Camo Kompass 1/4-Zip Top; $89.99 adidas Men’s Terrex Swift Soft-Shell Jacket; and more. Find all deals and offers in the latest Cabela’s weekly ad for your local store.